In 2017, KMM added a new Distracted Driving presentation for young drivers to our safety outreach program. The 45-minute interactive presentation, created by the Robert Wood Johnson Trauma & Injury Prevention Department, walks teens through sobering videos and interactive exercises that emphasize the life-threatening dangers of distracted driving. 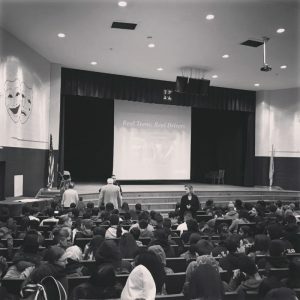 With assistance from the local Police Departments, more than 1400 students in Colonia, Woodbridge, John F. Kennedy High School in Iselin, Highland Park, South Amboy, and South River High Schools participated in this program. Sometimes, the discussion gets personal. During a presentation in South River High School, a police officer shared how his father died after a young distracted driver side-swiped him as he helped a disabled vehicle on the Garden State Parkway. In Highland Park High School, a teacher recognized the smiling faces of a young couple in a prom photo. They were her neighbors’ children and they died in a car crash shortly after that picture was taken. With tears streaming down her face, she described the anguish of losing these young adults and the impact it had on the entire community. 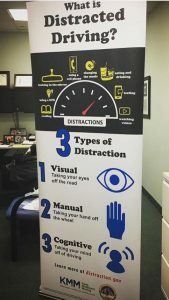 KMM’s goal is to empower and educate Middlesex County’s young drivers to act responsibly and pay attention behind the wheel so they don’t become another statistic of distracted driving. If you would like to bring this program to your local high school, please contact KMM at 732-745-4465.